Alex Smith investigates five of the best small sports cruisers money can buy. There are so many boats in the world that could conceivably define themselves as small cruisers. 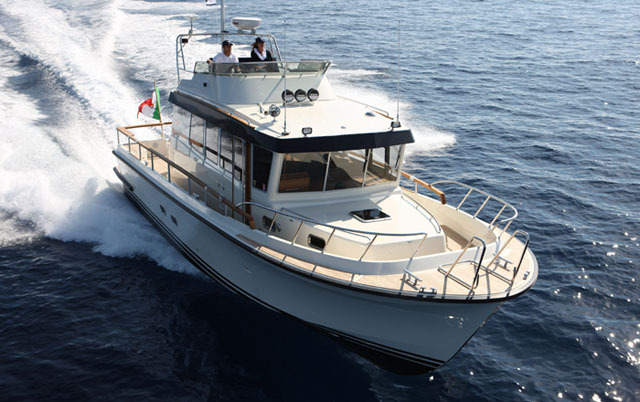 From dayboats with camping canvases to vertical long-distance trawlers, the variety is huge. But this is not about compact sporting cuddies with letter-slot accommodation implausibly crowbarred into the bow; and it’s not about bulbous, wallowing, wind-bullied 40-footers, bursting at the seams with lavish cabins. This ‘Best of’ roundup is a response to the sterling work being done in and around the crucial eight-metre mark, where a boat is expected to combine genuine family accommodation with pleasant outside space, credible sporting ability and moderately accessible pricing. It’s a devilishly tough balance to get right, but the following five do more than most in the current market to warrant a place on your shortlist. The Finnmaster T8 offers a huge cockpit and one of the best small-boat cabins you will ever see. Despite being one of the most beautiful looking boats on the water, this beamy 26-footer offers sleeping for four people in two cabins alongside seating for ten underway. Down below, big plunging hull windows well below the rubbing strake, allied to an angled bed with a compact port lounge area, create a main cabin of extraordinary loveliness. The views right down at water level are tremendous, the light is excellent and despite the modest proportions of the longitudinal guest double, the space is also very good. An eight-man dinette in the broad, open cockpit makes the outdoor space very inclusive and the ride through the chop is also remarkably user-friendly. At more than two metric tonnes, with a modest maximum power rating of 300hp, it’s by no means the fastest or sharpest handling small sports cruiser around but its safe family cockpit, its superb master cabin, its extensive features list and its indisputable stylistic impact makes the T8 is one of the very best in class. 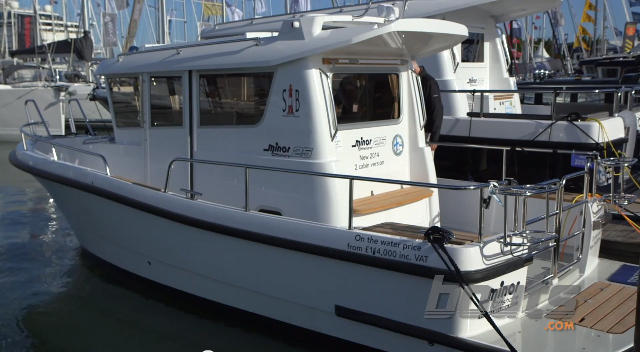 With the space benefits of outboard propulsion, the Flipper's aft cabin is a revelation. 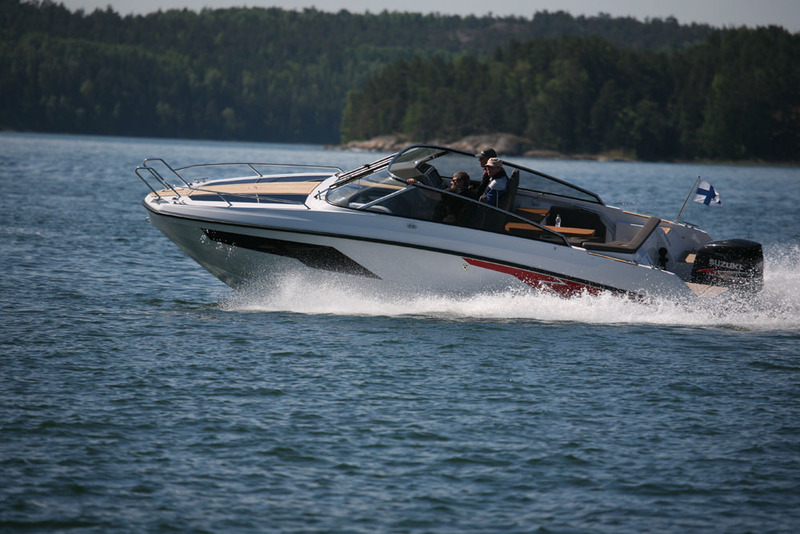 The aim of designer, Espen Thorup, with Flipper’s most recent designs is apparently to generate practical, high performing and safe boats that also happen to look fresh and feel good – and in that respect, the 880ST is right on the money. 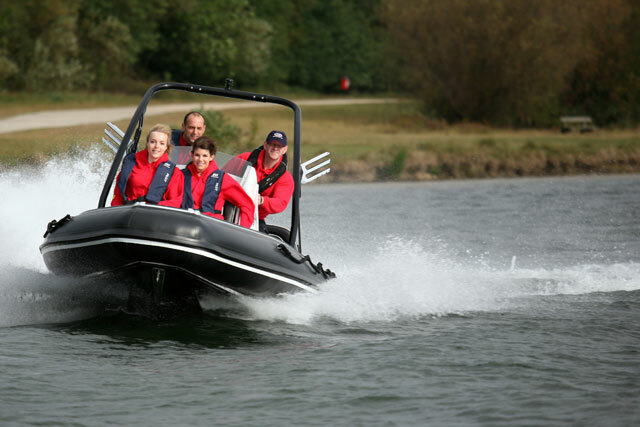 Up top, a large retractable roof section enables you to enjoy alfresco fun as well as closed-cockpit convenience; and the use of outboard engines also enables Flipper to really push the envelope in terms of accommodation. 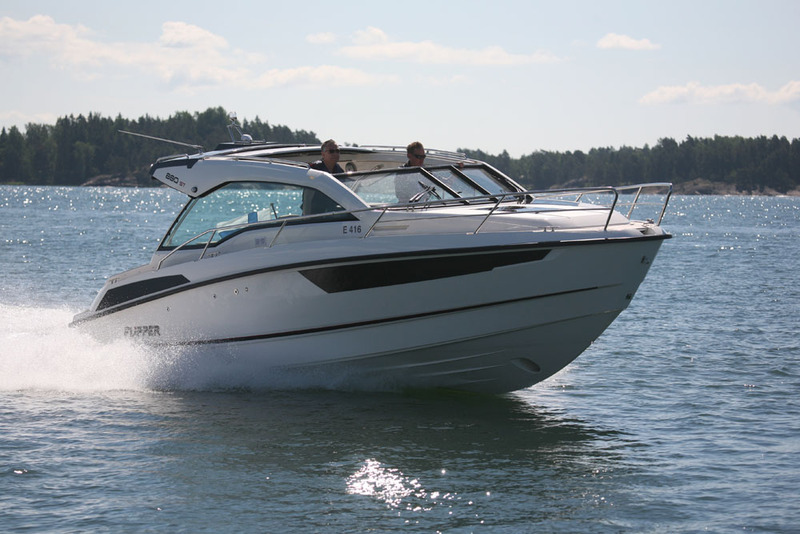 The greatest benefit of that is seen in the second cabin, which is lavished with a private and independent position way aft at the transom, in precisely the spot where an inboard engine might otherwise be housed. The light ingress throughout is exceptional and the cleanliness and modernity of the internal design and fit-out is also extremely striking. 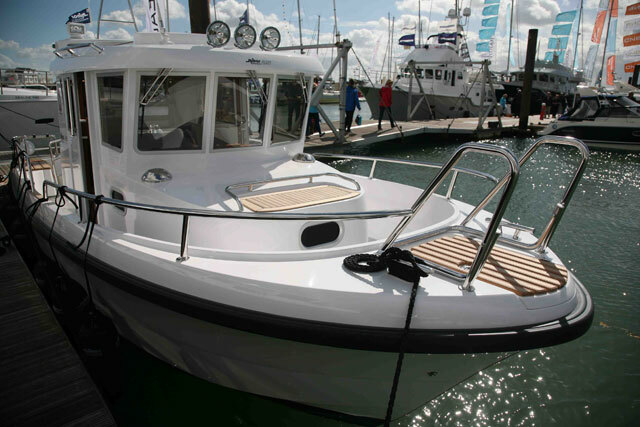 True, it’s a bit sluggish with a pair of 150s and the headroom in the forward cabin is not over-generous, but as a demonstration of how much can be achieved with an outboard rig on a family cruiser this tidy, affordable, ten-man platform is virtually without equal. 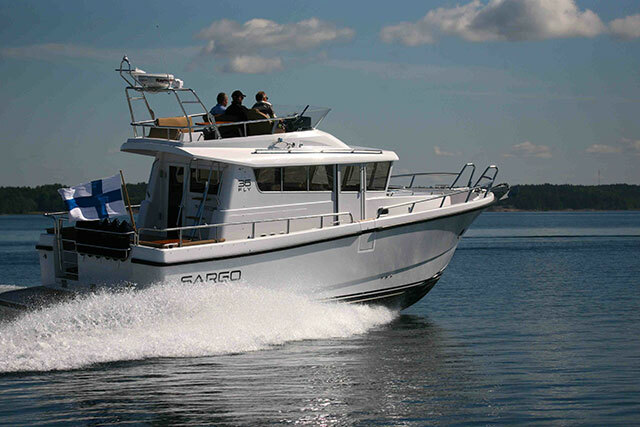 The Sargo 25 is without question one of the best value boats in the world. 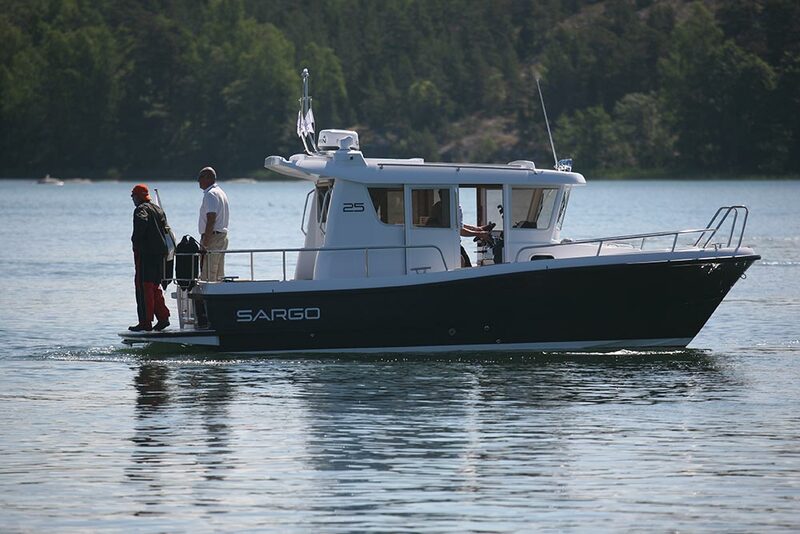 Will I ever stop harping on about the Sargo 25? Well given that the world seems incapable of coming up with anything that can beat it for sheer versatility and year-round useability, probably not. You get two cabins, the first in the bow and the second hidden away beneath the saloon seating; you get a separate heads compartment to starboard, a set of convertible galley equipment at the dash and a fridge beneath the helm. You also get an all-weather wheelhouse, safe wraparound decks and decent external spaces fore and aft. But the best part is undoubtedly the stoic, unflustered, soft-riding potency of the performance. It’s altogether too grown-up and capable to give you unbridled thrills at the helm, but its capacity to take you pretty much wherever you want to go whatever the time of year and then provide decent accommodation for four when you get there makes it one of the very best compact cruising companions on the planet. 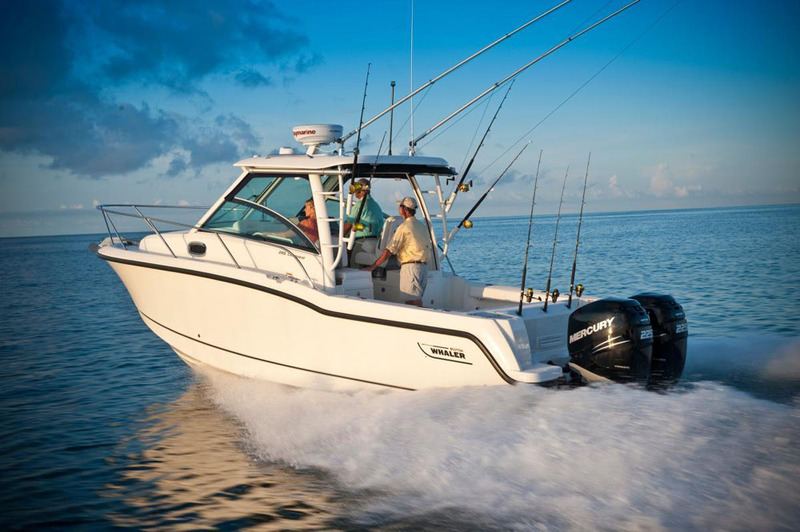 Boston Whaler's entry-level Conquest is a very versatile platform. 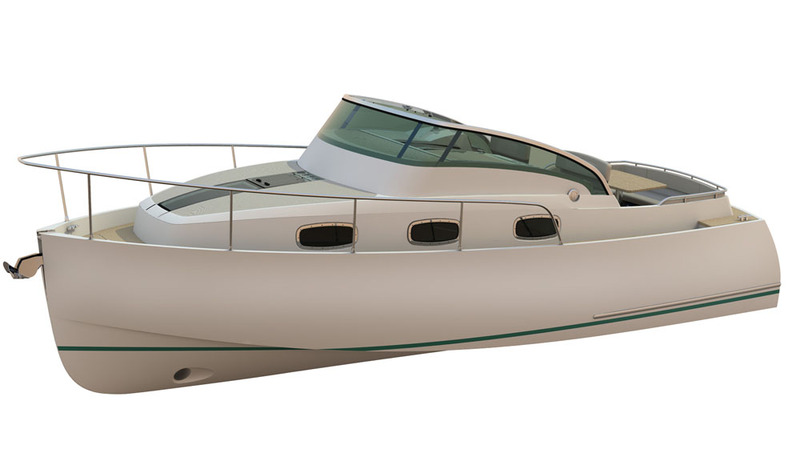 It might be the smallest of the Conquest line, but the 285 is a serious (and seriously versatile) boat. In addition to its heavyweight lay-up, acutely angled hull, wide beam and Mercury Verado outboard, the 285 offers plenty of storage, versatile seating and alfresco deck space every bit as generous as you would expect of an offshore fishing specialist. For cruisers and overnighters, the below decks region encompass sleeping for four in the forward berth and mid-cabin, as well as a proper galley and a private heads compartment. Okay, so it’s by no means a new model, but it’s built like a tank, it can handle a decent sea and it comes with the sturdy residual values for which the builder is famous. If you can handle the lofty purchase price and the modest styling, that makes it a very useful option for the demanding family cruiser. Boston Whaler 285 Conquest review. The English Harbour 27 makes tremendous use of its modest length. This second entry in the ever-expanding English Harbour fleet is designed to combine a great many talents in a single platform. It uses a semi-displacement hull by Andrew Wolstenholme with a full-length keel, which is optimised not just for the genteel inland pursuits to which its aesthetics seem so well matched, but also to concerted coastal and offshore use. Adam Greenwood has also been involved in the design and he has made great use of a monster beam (more than ten feet at its widest point) to incorporate two separate cabins that can be converted from twins to doubles, as well as a heads with separate shower compartment and a spacious saloon with dining space for six. You also get no fewer than five engine choices, as well as an all-electric e-drive option for the frugal and the eco-sensitive. With fit-out and finish that looks just as good as the company’s lovely little 16-footer, this thoroughly British boat even buys you the chance to erect your jingoistic bunting and celebrate the rare and pleasing purity of its heritage. 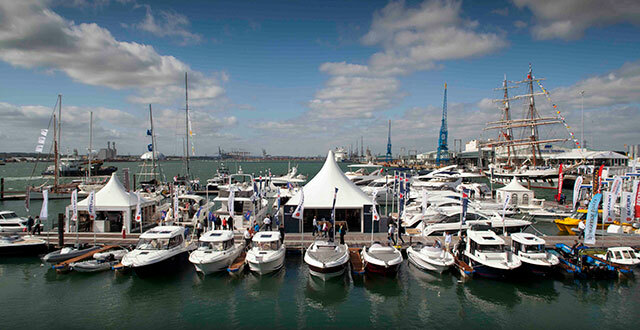 See a preview of the EH27 and six other boats launched at the 2014 Southampton Boat show: 7 of the hottest powerboats at Southampton.